The new iPhone XR is now (as of Sept 27th 2018) certified by the Federal Communications Commission (FCC) weeks after its debut, unlike Apple’s iPhone XS and iPhone XS Max models which were unveiled on September 12th, 2018 with all FCC regulatory RF safety information available. 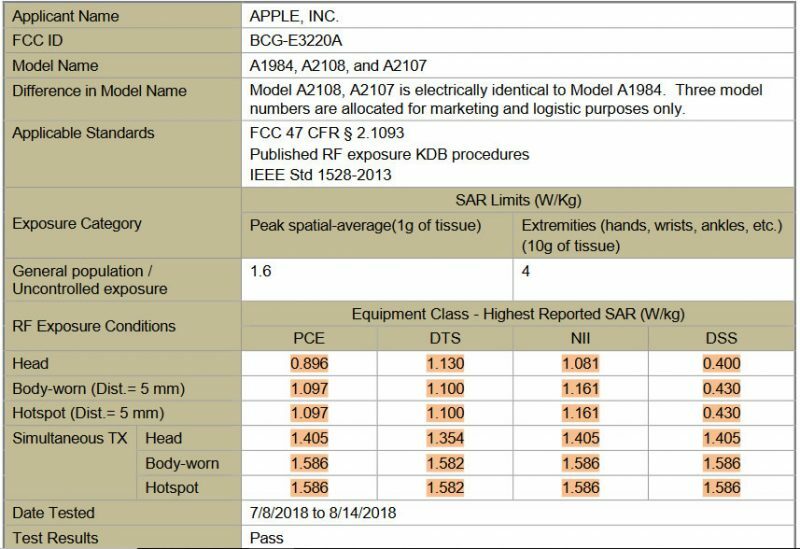 The FCC report reveals that the smallest of the new 2018 iPhones emits the highest SAR level for simultaneous transmission. Only one tenth of a watt under the legal limit! According to test reports filed with the Federal Communications Commission (FCC ID BCG-E3220A, the Specific Absorption Rate (SAR) for the Apple iPhone XR is 0.90 watts per kilogram (w/kg) at your head, and 1.10 w/kg when worn on your body. The Apple iPhone XR hotspot SAR is 1.10 W/kg. The SAR for simultaneous transmission (cellular, Wi-Fi and Bluetooth) for the Apple iPhone XR is 1.59 W/kg when used as a hotspot simultaneously with all other transmitters active. This health and safety data is probably the only thing about the iPhone XR that Apple has been able to keep a secret, but still, leaves a mystery for those that have concerns about iPhone XR radiation exposure before pre-ordering this new lower-priced iPhone XR smartphone. If you have been searching for the new iPhone XR SAR (Specific absorption rate) levels, you can stop searching now. The iPhone XR had not been authorized by the FCC yet as of 9/15/2018 according to Apple’s website. iPhone XR has not been authorized as required by the rules of the Federal Communications Commission. This device is not, and may not be, offered for sale or lease, or sold or leased until authorization is obtained. The trillion dollar Cupertino company must obtain an authorization from the FCC for RF radiation safety compliance to sell iPhone XR in the United States if they plan to start taking pre-orders for iPhone XR with a starting price of $749. The device is scheduled to land on store shelves in October, and consumers may have to wait until then to find out their radiation exposure levels when using an iPhone XR. Apple has a history of guarding this RF safety information until the last minute. While required by law, Apple makes no effort to go beyond fine print warnings, much less straightforward RF mitigation technologies to ensure the safest possible devices for our children. Few remember when Tawkon developed an application to measure the amount of radiation coming from your iPhone that alerted users when exposed to excessive radiation levels. The late Steve Jobs wanted no part of it, in a twist of irony, it was cancer that took Steve Jobs from this world; he may have been a genius in many ways, but not in cancer prevention. Click here to read the email exchange between Jobs’ and Tawkon. Apple’s choice for using model number A1984 is like a reminder of Apples 1984 Super Bowl Ad that seems to define the corporate culture of this organization and the values towards controlling information its customers see. Unfortunately, Apple fails to tell you a few things that can help reduce iPhone XR radiation exposure. Avoid using the iPhone when the signal is very weak. Avoid using iPhone in a car, bus, subway train or metal enclosure. When an iPhone is powered on, never keep the iPhone against to your body, especially during a phone call. Also, RF Safe phone accessories have been proven to reduce rf exposure but Apple won’t tell you that!